The 49.8 metre sailing yacht Silencio, listed for sale with Jonathan Barbe at Edmiston & Company, has been sold with Aquamarine introducing the buyer. 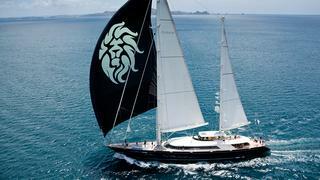 Built in steel and aluminium by Italian yard Perini Navi, she was delivered in 2001 as the third yacht in the yard’s successful 50 metre series. Her generous accommodation sleeps up to 12 guests in five well-appointed cabins including a full-beam master suite which can be converted into two individual suites if required. All cabins come with television screens and full en-suite facilities. On the main deck, a large saloon with joinery in fine cherry wood is surrounded by large windows affording terrific views and has an entertainment centre with a large television screen and a Kaleidescape server with over 300 movies on demand. Forward is a formal dining room. Extensively refitted in 2012, she features a sleek and sophisticated custom interior by the award-winning designer Christian Liaigre. She boasts a light and airy on board ambiance thanks to her contemporary design and use of elegant upholstery. A successful charter yacht, Silencio has also proved her worth at regattas, winning the 2013 Perini Cup and the 2015 Millennium Cup. Her refit, undertaken in the Perini Navi shipyard in Viareggio, resulted in larger outdoor spaces, more al-fresco dining areas and ample sun bathing areas. Under power, twin 979hp Deutz engines give her a range of 3,100 nautical miles at her cruising speed of 13 knots.